Finally! The blog gets its very own meeting place for foodies; Tastecelebration Residence. Now we are open! This is something we have been working for a long time and finally we have opened our doors! 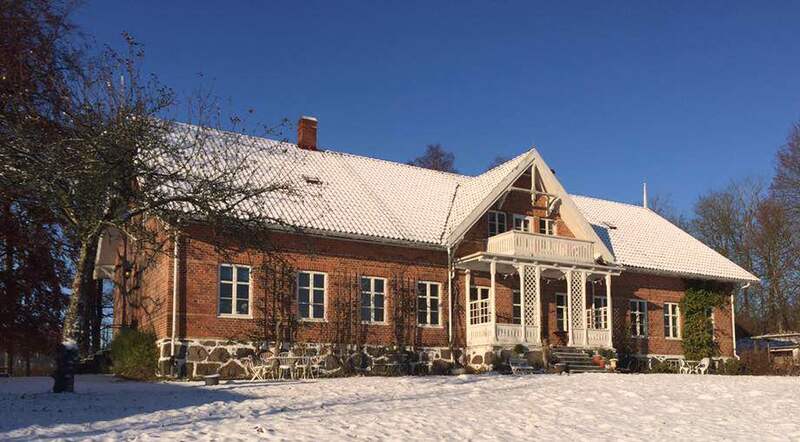 We open our residence in the small village of Andrarum in Österlen, Skåne, Sweden. Together with my husband Joost, we have created a place completely built on my huge passion; food! In fact, in principle everything is about food in one or another way in our amazing Jägmästarbostad from the late 1800’s. In the house you find a coffee shop and restaurant, a small hotel with four double rooms, a cookbook library, spaces for smaller conferences and exhibitions. We open our residence with a fantastic exhibition of food photography, Hungrig! (hungry in Swedish). A delightful exhibition of photos from the magazine Vegourmet and the photographer Magnus Holm, myself and three happy winners from the Instagram competition we held earlier this year. The exhibition can be visited until August the 31st this year. I can almost guarantee you will get hungry when walking around in the exhibition and then its good to know that we have great food ready for you. Enjoy a lunch, a Swedish sweet fika, a good cappuccino or a full dinner combined with delicious wine or beer if you wish. All food served is focused on green food just like on the blog. Finally take a rest in our hotel rooms, dream sweet dreams and enjoy a good breakfast before it’s time for new adventures. Perhaps, perhaps, you might just choose to just stay in bed and enjoy the light and silence. Or maybe you decide to follow a course with green cooking or food photography before heading to the garden with a cookbook in one hand and a cup of tea in the other one. Life is good! Address to Tastecelebration Residence is Jägmästarbostaden 101, Alunbruket. The restaurant is open from Friday to Sunday from 12:00 to 21:00 and Tuesday 9:00 to 17:00. The exhibition Hungrig! opens on March the 30th and is open until August 31, 2018. Find more information about Tastecelebration Residence here. Filed under: Tasty news, What's cooking?